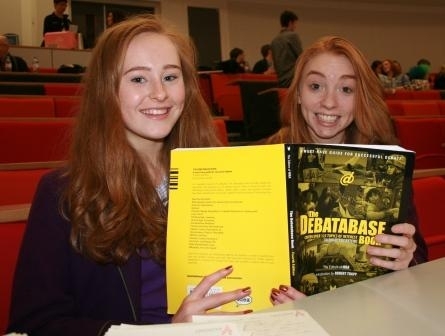 On Saturday 16th November, two Year 11 students, Flora Robson and Annabel Steele, and two Year 8 boys, George Ward-Thompson and Ben Tinniswood, attended Lancaster University’s Debating Competition. Students competing in the event are generally sixth form students, therefore it was always going to be a challenge, but this did not deter our Westholme students. The first motion to be debated was ‘The British armed forces should be dramatically reduced in size and capability to the point that they are unable to attack another nation’. Annabel and Flora won this round, beating Central Newcastle High School and Burnley College. Encouragingly, George and Ben came second to Flora and Annabel. Although Westholme did not win the overall event, the day was a resounding success. Our students learnt how to put an argument together in fifteen minutes. They learnt new terms, strategies and skills that they will be able to utilise throughout their lives. Additionally, we feel that we may be educating future politicians. If Flora, Annabel, George and Ben ever decided to venture into politics, they would always win our vote whichever party that they decide to represent!